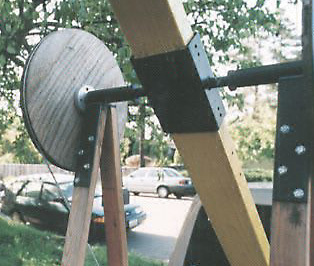 Here's how I made the plywood throwing arm for my biggest trebuchet. I put down a layer of waxed paper on a long, straight bench, then slopped on the glue and clamped eight: 1/2in. x 4in. x 8ft. strips of plywood together. After all was glued up, I ran both sides of one end through a bandsaw, then I cleaned up the cuts on a jointer. This produced a throwing arm that was lightest on the payload end and heaviest on the end with the weights. The big prototype led me to build two half-scale models which had 6ft. long 2x4 throwing arms. These two stood about 4ft. tall at the alxe and each used about 45lbs of lead for counterweights. 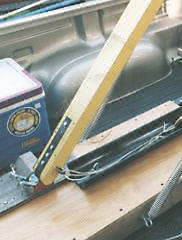 The neat hack on this one was the adaptation of a standard $4.- gate latch as an arm release. With this simple off-the-shelf device, the shooter could stand to one side and jerk on a lanyard to release the pendulum, which made the proceedure a little less hazardous in the event of a misfire. These machines can hurl a lemon about 40 to 50 paces, so I painted the throwing arms bright yellow. Not knowing what was an optimal ratio of throwing-arm length to counterweight-arm, I made all adjustable, by passing the arm through a section of rectangular pipe. The arm was fixed in place by bolts that squashed it between two 1/8in. thick steel plates (to spread the force exerted by the bolts). Likewise, the trigger was fastened to a block that could be moved forward or backwards about 6in. (see previous photo). To increase the "oomph" delivered to the throwing arm, I added pulleys to either side of the axle. 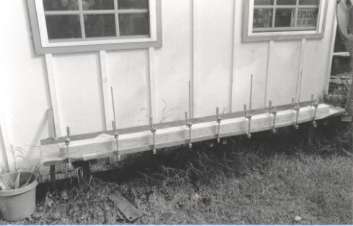 I fastened lengths of braided steel cable about them and then attached garage door springs to the free ends. The springs in turn are fastened to the base so that the effect of the small counterweight is amplified by the two stretched springs. Buoyed by my success at this reduced scale I next produced a batch of 10: 1/4-scale siege engines. The throwing arm is a 1in. dia. 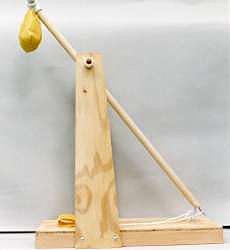 wooden dowel and the counterweight is about 5lbs of sand or rocks, held in a canvas pouch, which is free to swing and so increase efficiency. 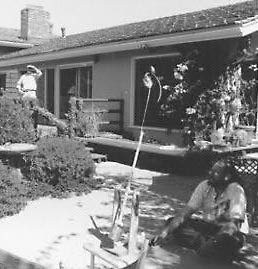 Here an early prototype releases a lemon on just the right trajectory. Various folks have been playing with these for a few months now and one team reports that dog biscuits have achieved distances exceeding 30ft, making it the perfect backyard toy for hyperkinetic doggies. These little trebuchets have worked out so well that I am now offering them in kit form, with an illustrated assembly manual. All holes are pre-drilled and the unit can be assembled with a screwdriver and a pair of pliers. Price of this mini siege engine is $60.-, including shipping, taxes and all that crap; you supply the sand and the biscuits: all else is included. Delivery is approx. 4 weeks, depending on availability (at the moment I'm out of stock!). If you are interested, please email me. At the moment I am heading towards still smaller machines and I now want to make a machine that is half as big as this one. I'll have to depend on something other than a counterweight and rat trap springs seem promising. Maybe a grape would be the appropriate payload: time and experiments will tell! 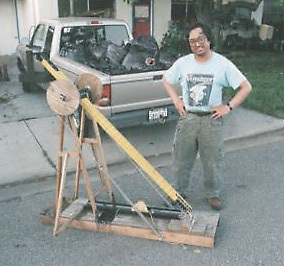 The NF/Observatory siege engine project. Written with a bit of panache! 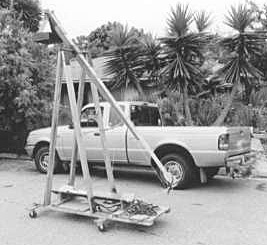 Ron L. Tom's Trebuchet Resource Site How would you like to RIDE a trebuchet??!! He's got a HUGE (but un-sorted) collection of email he's received or located on the topic, too.